We’re proud of the many success stories achieved through our programs each year. Following are a few of our all-stars who, with our help and their very devoted mentors, have turned their lives around. Tasha was in-and-out of nine detention facilities between the ages of 12 and 14, but after learning how to write a “Moesha” TV script, she discovered that she loved the film and TV industry. Tasha was such a talented, bright, and enthusiastic participant that she had a number of mentors who loved working with her. Tasha received a scholarship from Warner Bros. Studios and graduated from the USC Film School Program with a B.S. degree in 2004. Through the efforts of her Create Now mentors, she also completed her first year of law school at Northern Illinois University in Chicago. Tasha has published three books (all available on Amazon). She has been writing film reviews for the “Chicago Drama Film Examiner” for several years and has written a number of screenplays. She has performed standup comedy all over the country and produced and directed a feature documentary, The Makings of a Standup Comedian, and is now working on another documentary film. Watch Frank and Michael featured on Univision’s “Nuestra Navidad” with Gloria Estefan at the White House in 2009. Frank was headed down a dangerous path. He never knew his father, who had abandoned his family many years ago. His two older brothers were in prison and he was forced to take care of his younger siblings while his mother worked hard to support her family. He joined a local gang in Compton and got in trouble for ditching school and doing drugs. The court sentenced him to live at a facility for troubled youth. Create Now got a call from Frank’s social worker, who was trying to find a mentor for the youth. He had a passion to learn how to play the saxophone and the social worker was able to get one donated, but he still needed lessons. We got Frank free saxophone lessons during the summer through the Henry Mancini Institute. Then we arranged a private lesson for him with his favorite saxophonist, world-famous musician Michael Lington. Frank was a huge fan and knew every note of Michael’s songs. After spending just one hour with Michael, Frank changed his life. He dropped out of his gang and joined Compton Community College, becoming the First Chair Sax! He continues to do well as he plays the horn today (Create Now got him a new sax when his instrument broke). Liz was constantly fighting at school. She was sentenced to spend time at a juvenile probation facility. She signed up for a role in a performance of “That 70’s Show” during our Theater workshop. We arranged for all the kids at this detention center to visit a taping of the show and meet the cast and producers. Liz became hooked on acting. She took advantage of different opportunities that we provided, including the chance to meet the Honorable Mayor Antonio Villaraigosa. Create Now helped Liz to get headshots and gave her books to assist with her career. She took classes in modeling and acting while raising her two sons. 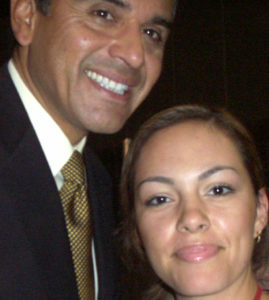 Create Now helped her to meet Mayor Villaraigosa and provided her with additional resources. As a result, Lizeth is now an Executive Assistant to the Director at North Los Angeles County Regional Center, which provides partnerships and planning to people with developmental disabilities. Before that, Liz was a Certified Paralegal to Stanley Morgan, Esq., and a mortgage trustee and foreclosure specialist at GMAC. She also was an Executive Administrator and liaison at Resource Program, a marketing company, where she oversaw the administration, compliance and customer relations departments. In addition, Liz was a Production Assistant at Kevin Hart’s company, HartBeat Productions. Over the past 21 years, Create Now has reached more than 42,000 of the neediest youth in Southern California.